For my birthday, Bradley bought me new dining room chairs. 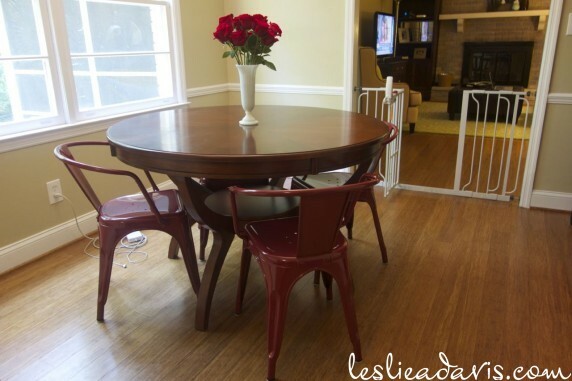 We purchased our current dining room table and chairs second-hand when we moved into our first house. They are very solid, but the chairs are not comfortable for guests to sit and visit after the meal is over. 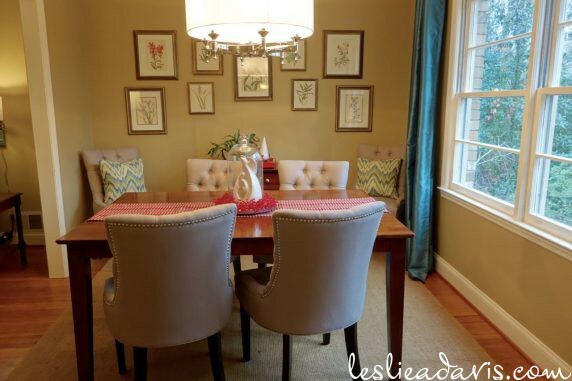 I’ve had my eye on this type of upholstered chairs for years now – they are just quite pricey. I happened upon a deal at Home Decorators and sent it to Bradley. He jumped on the site and bought me six immediately, for at least half the price I’d seen them in the past. The finish on the legs is darker than our table, but it doesn’t bother me at all. I’m just glad to offer comfortable seating to our dinner guests! 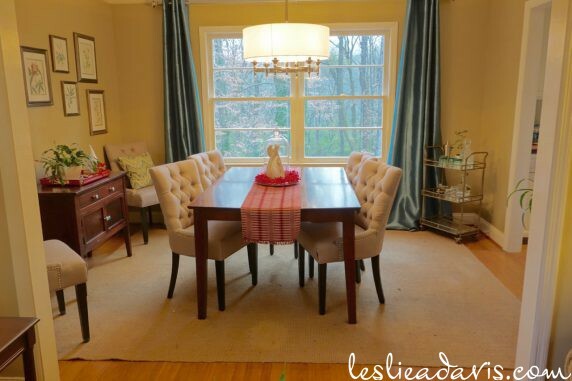 This entry was posted in Dining, Our Forever Home on December 23, 2016 by Leslie. 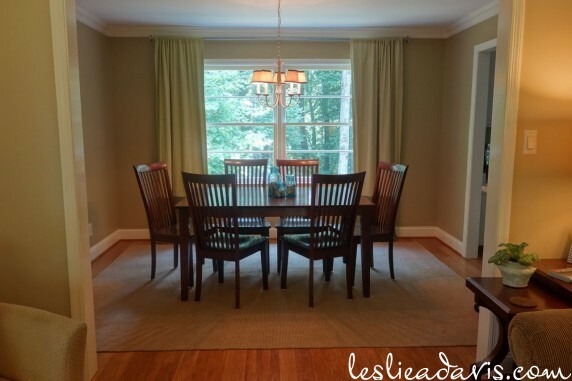 When we first moved into our forever home, there was a Tiffany-style light in the dining room. It wasn’t my style and didn’t really match the style of the house. 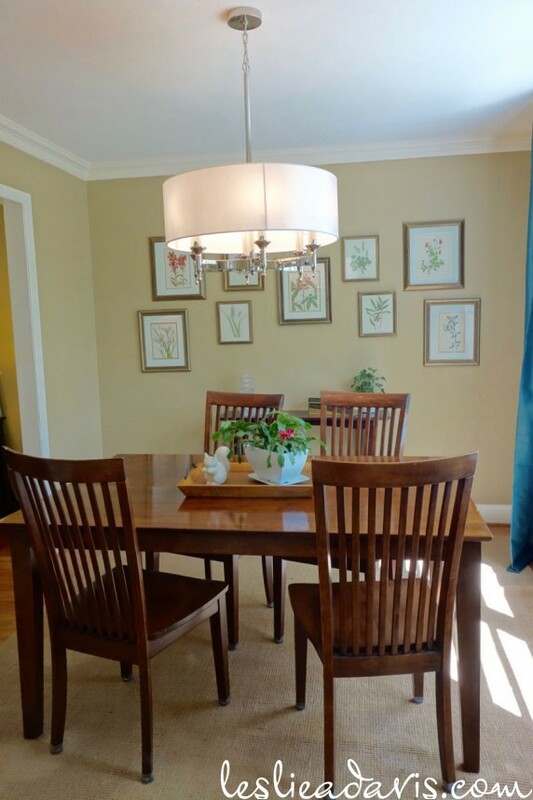 For an immediate solution, Bradley hung a brushed nickel five-arm chandelier that I had picked up at Goodwill. It was underwhelming and I prefer polished nickel, but the one I liked was not in the budget. We lived with it for two years. I kept watching the chandelier I liked, but it only rose in price over time. Then a couple of weeks ago, it popped up on Joss & Main for less than I had ever seen it. I also realized that it had been discontinued at some point, so all of the vendors that stock it online would eventually not carry it anymore. So I decided to go for it. Bradley got it hung for me, and I am really happy with the style, finish and size. It is the Pembroke 6-light chandelier by Elk Lighting. 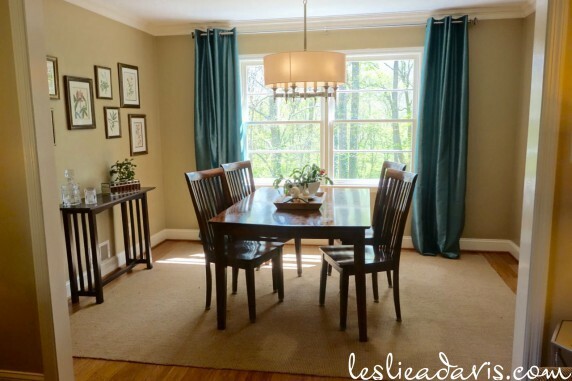 This entry was posted in Dining, Our Forever Home on April 8, 2016 by Leslie. 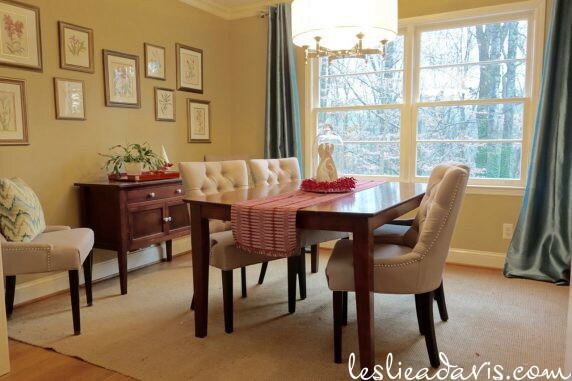 In the dining room, I have rearranged our existing furniture to give it a fresh feel and see what I like. With the table lined up long-ways to the window, I felt it gave more room for a table on the only wall without a door or window. I would love to have a sideboard table like this, but it isn’t a high priority financially. 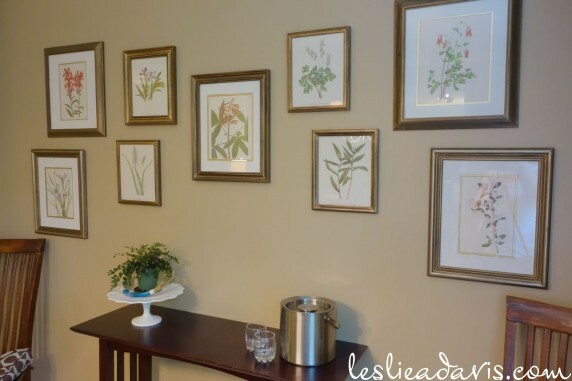 I saw this collection of botanical prints and was inspired to add some to our house. I ordered this book from Amazon, because I wanted to use drawings of flowers that are native to our area (many of which are now in my own yard thanks to my mom). 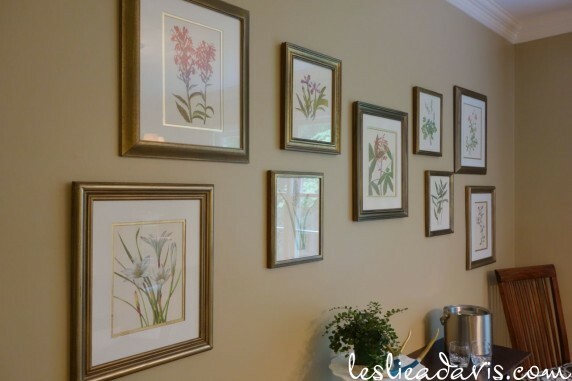 I framed them in gold frames that I picked up at Goodwill and used a Martha Stewart metallic glaze in Coffee to tone down the gold. There were quite a few more prints that I would like to have used, so I may add more down the road. For now I am displaying Atamasco Lily, Red Cardinal flower, Fly Poison, Dwarf crested iris, Red Buckeye, Dutchmen’s Britches, False Soloman’s Seal, Eastern Columbine, and the Red Chokeberry. On the side table, I placed a lemon button fern on a milk glass cake stand. 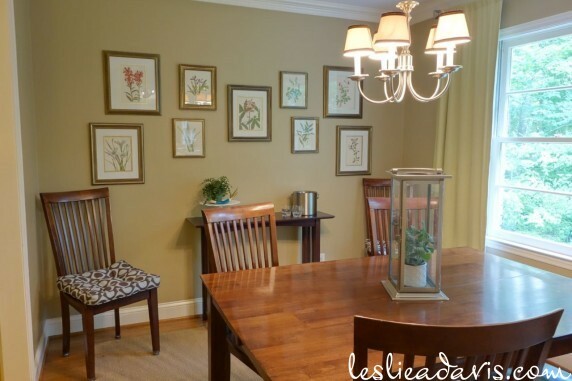 This entry was posted in Dining, Our Forever Home on July 29, 2015 by Leslie. 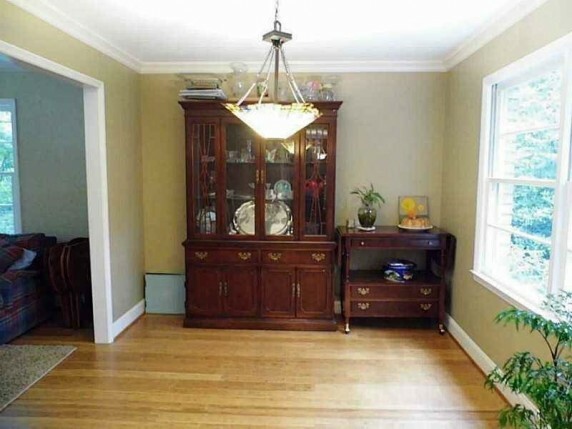 Just like the living room, there isn’t much to show in the dining room right now. The wall color is the same as the living room, Gobi Desert by Behr, and was already painted when we moved in. The only thing we changed when we moved in was the light fixture. There were Tiffany-style lights in this room, the foyer and the stairwell. As a quick fix, we exchanged the lights with the corresponding lights from our old house during the move. This chandelier is too small for the space, but I’m not ready to drop the money for a new one yet. 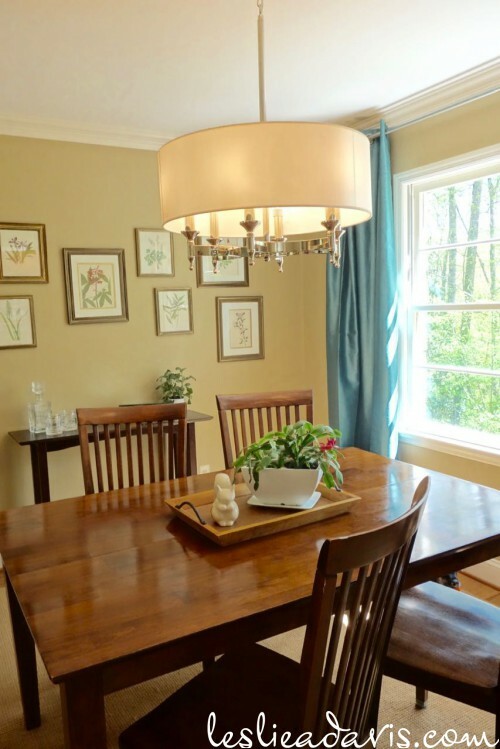 The dining set is the same one we bought off of Craigslist for our old house, a dark-stained teak set with concealed leaf that can make the table a square (which worked much better with the room shape at the old house). The only thing I have added was an inexpensive jute rug to protect the floor. Eventually I would like to replace the light fixture -I’m leaning towards this chandelier. Also, a part of me would love to one day add coffers to the ceiling, something like this. In the kitchen, we recently bought a table off of Craigslist for the breakfast nook. I found the red industrial chairs on clearance at Target. I wanted them as spare chairs to bring out if we host get-togethers, but since there were no chairs for the table we bought, I am using these for now. 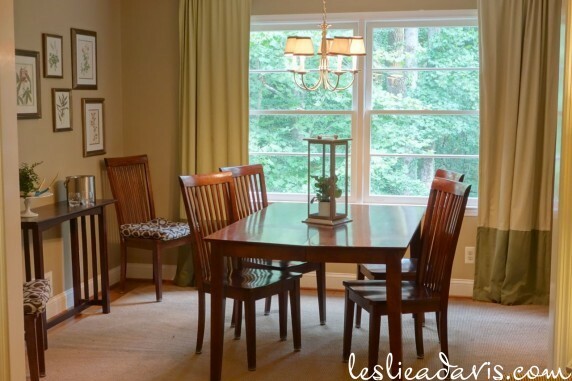 This entry was posted in Dining, Our Forever Home on July 9, 2014 by Leslie.